Cooking a whole chicken can be slightly intimidating. It is difficult to mess up when you have a good seasoning to use. Simply rub your bird with the following whole chicken rub recipe and let the oven do the rest of it work. Warm oven to 400°. Prepare a 3 to 3 1/2lb chicken by removing the giblets and neck. Rinse thoroughly and pat dry. Spatchcock or butterfly the chicken by cutting along one side of the chicken's backbone. Open up the bird to lay flat in roasting pan. Cut along the other side to remove the backbone in its entirety. Rub the chicken on all sides with 2 tablespoons of olive oil. Combine and mix all spices together to create the rub. Sprinkle the chicken rub liberally until covered. Place in oven and cook for 50-75 minutes or until the internal temperature reaches a minimum of 165°F. Optional: Place the chicken in a zip lock bag and set overnight in your refrigerator to marinate completely for 24 hours before baking. 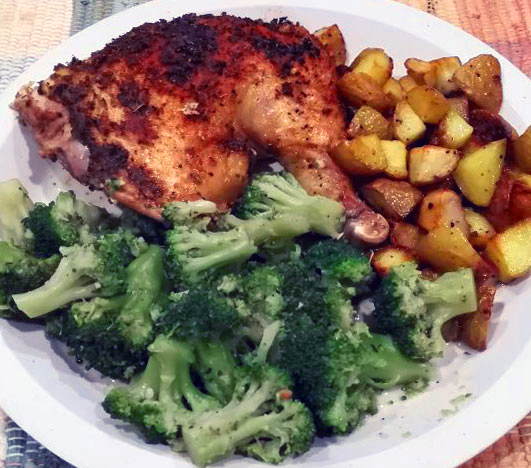 Combine Chicken with Roasted Potatoes and Broccoli Florets for a delicious meal. Oh wow this sounds perfect for a Sunday meal – definitely one of the favourites of my husband’s. With healthy veggies, perfect. Eva, this is a perfect family dish. I am sure your husband will love it. You’ll laugh, but I’ve always had a hard time eating chicken that looks like a chicken haha! But years ago, a whole foods chef showed me how to roast one and it was delish! I did, however, make my husband do all the prepping and also made him platter the meat of it before I could eat it. This recipe looks yummy, so I guess I’ll give it another go! Thanks for sharing! Kristi, Thanks for sharing your story and experience. You can use the seasoning rub on skinless breasts as well and roast in a pan alongside some green beans and quartered potatoes. Simple, healthy and looks yummy. This kind of recipe is the type that becomes a family favourite. Diana, I agree! It is good to have simple easy dinner planning for the family. This looks so yummy! My family loves chicken and I’m sure they would love this recipe. Can’t wait to give it a try. Tasheena, This is the perfect family recipe. It yields a lot! This sounds very good. Chicken is one of the few meats my youngest is reliable about eating. Glad that you’ve shared a final meal idea with potato and broccoli.This sounds a complete meal.Also,the chicken looks delicious! Thank you so much. Simple and complete is what I like. 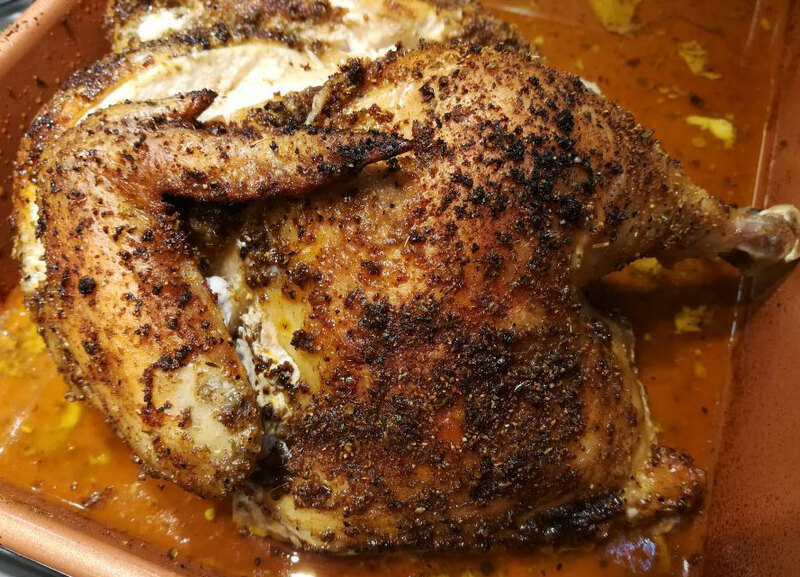 I love a good roasted chicken and use rubs a lot, not just on them. Part of the fun of cooking is experimenting with new seasonings and herbs. It is amazing what types of new flavors can be made when you try something new. They are so good for you too! I’m drooling as I read this, wow looks amazing and seems so easy! Spices can go a long way in making a great meal. This looks delicious! I’d have to try this for my little ones, super simple and quick for nights we are busy. You should even find yourself with some leftovers afterwards. This looks so easy to make, I have never roasted a whole chicken before. With this recipe of yours, I am surely going to try it out! Great to hear! You can also use the rub on chicken breasts to bake in the oven.